Driver/passenger front airbags,ABS,Air con,Power steering,Remote central locking,Immobiliser,Alarm,Electric windows,Electric mirrors,front foglights,5 seats with folding rear seat,3 point interia seat belts,Stereo and CD changer,Full leather seats,17 inch straight Alloy wheels. Seling on behalf of a customer, we have looked after the car since 2011.The two previous owners are from the same family. Full service history on mileage (7 stamps) including uprated MLS head gasket and timing belt kit at 48000 miles carried out in our own MG Rover workshop. A recent new rear exhaust box has been fitted. The grey alcantara and black leather seats and interior are in good clean condition. The firefrost metalic bodywork is in good condition for the age with only one minor mark on the rear bumper. There is no rust present. The very quick 1.8 VVC engine and gearbox are in very good condition and the car drives very well. The full log book is present and the car is HPI clear. 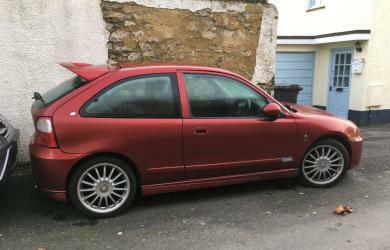 An opportunity to buy a rare model MGZR 160 VVC, as they are now hard to find. Please contact us for an appointment to view.